Despite having played lots of PSVR games there haven’t been many really great games until recently. Titles such as The Persistence and Firewall: Zero Hour have really shown what the hardware is capable of. 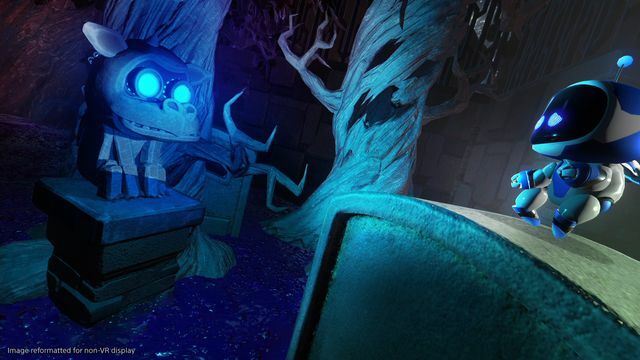 Astro Bot Rescue Mission is a VR platformer that continues the strong run with, for me, the best PSVR game yet. From the moment the game boots up you can tell that this is a really special title. Everything just looks and sounds wonderful giving a really polished feel. The cartoony graphics are a perfect fit for the game and make it look better on the PSVR than if they were aiming for realism. The game has a simple story where the spaceship of Astro, the cape-wearing captain Bot, and his crew is attacked by an alien. The attack leaves the ship damaged with the crew and parts of the craft scattered among nearby planets. Your job is to take control of Astro to guide him across the planets in search of the missing ship parts and crew. In the game you play as a giant robot who controls Astro. This is done using a DualShock 4 controller and a neat touch is that a virtual version of the controller is visible in VR. When you start a level, Astro spawns on your virtual touchpad before jumping into the environment. 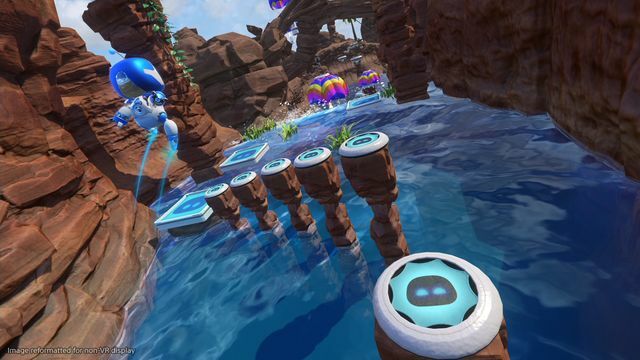 The platforming action is set all around you and it’s an absolutely magical experience. Astro and the other Bots are tiny but full of personality. The way they wave at you when they see you just makes you smile and is so cute it never gets old. Somehow the game makes you feel really responsible for Astro and it makes you worry for him the further away he gets. Despite fully controlling him he also feels like a kind of teammate who is working with you. The left stick makes Astro move around with the X button used to jump. 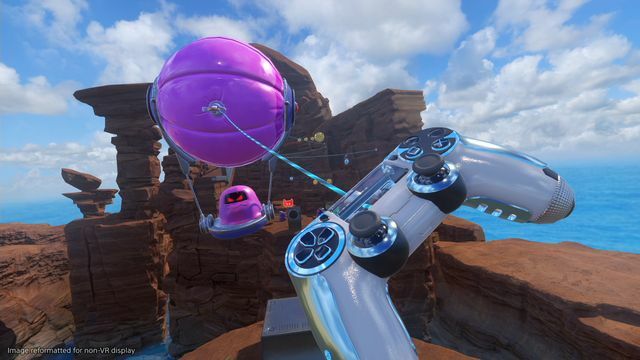 Holding X while airborne makes Astro hover for a short time and instantly reminds of using FLUDD in Super Mario Sunshine. Nintendo make the best platformers so this is high praise indeed. The Square button is used to make Astro perform a punch attack while holding it charges up a spinning attack to take out multiple enemies. 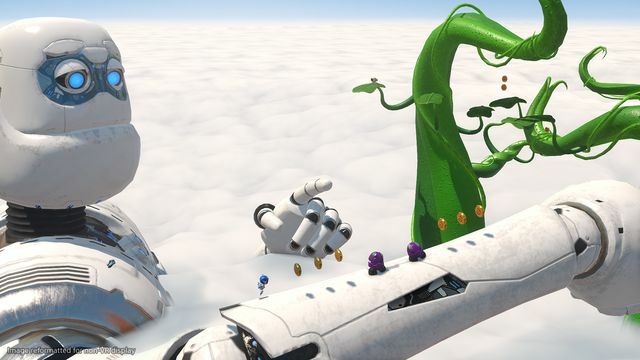 The platforming is absolutely sublime and made even better by the way it’s all around you. The game works well when played seated as long as you have enough room to turn around. Being able to move, turn, lean and stand is key to the gameplay and leads to some unique mechanics. 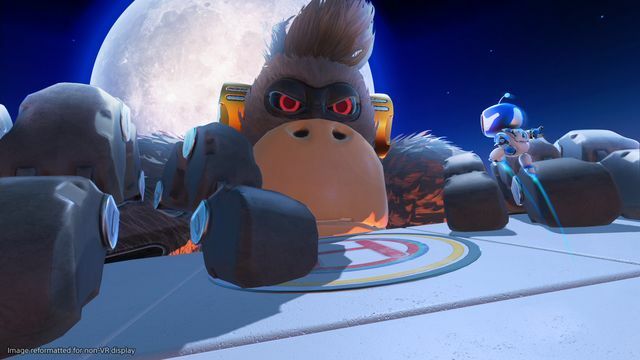 For example, Astro might be stood next to a hole but if you lean forward and look down there might be a reason to jump down, such as a crew member or coins to collect. Leaning is also often needed to look around walls. Similarly, standing up can be useful to get a better view of things. As you make your way through the environments it pays to look around everywhere and to listen carefully. Each level has eight crew members to rescue but only a few of these are obvious. Often these crew members are out of sight so listening is important because it lets you hear them shouting to get your attention. 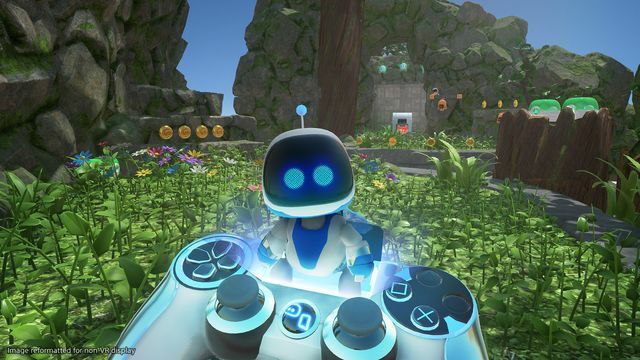 When you do rescue one, Astro gives them a little kick and they shoot into the air before landing on your virtual controller. A really cool feature is that some parts of the game require you to interact with them by dodging or performing a headbutt motion. This is used for things like breaking down certain barriers and attacking enemies. One of the enemies is a robot wasp which initially requires a headbutt to kill. Later they become aggressive and you need to dodge their stings before timing your headbutt. Certain enemies and obstacles can obscure your vision for short periods. The game does a great job of constantly introducing new mechanics to keep things fresh. 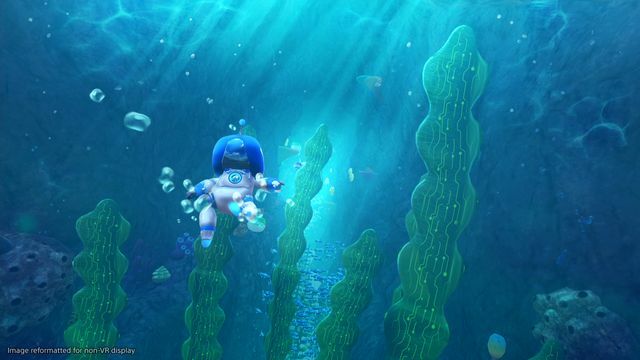 As well as the platforming, Astro gets to go swimming. 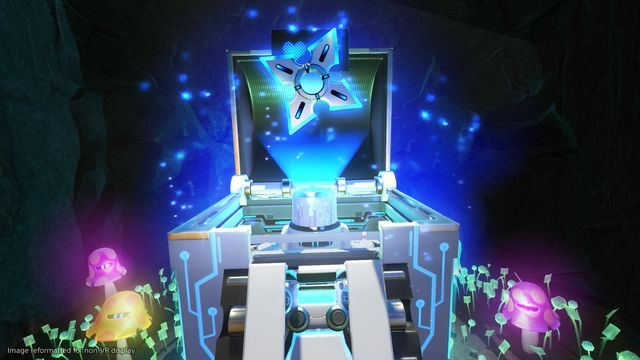 Sometimes you’ll discover a chest that upgrades your virtual controller with a new gadget. The gadgets are brilliant and can be activated via the touchpad, these include a grapple hook, water gun and even ninja stars. Using these adds a lot of variety and fun to the game and each can be used in a variety of ways. For example, the grapple hook can be used to pull down walls or create a tightrope for Astro and you can even catapult him up into the air. 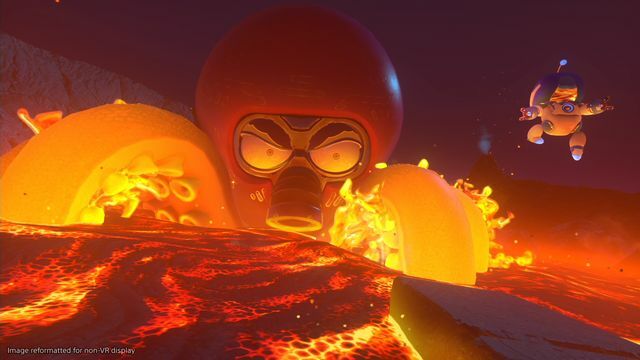 Some of my favourite parts of the game were the boss fights. These put you up against some truly huge boss enemies and make you use the different mechanics that you’ve learnt to defeat them. The first boss fight is reminiscent of King Kong atop a high tower. Here you need to defeat smaller enemies and time your runs to get in close to damage the teeth of the gorilla. Once damaged you can attach your grapple and pull them out which is ridiculously fun. Throughout the levels are hidden chameleons to find. When you spot one you need to stare in its direction to reveal it fully. For each one you find you unlock a challenge level and each one is addictive and tricky. There’s a nice variety from timed speedruns to throwing objects at enemies. You need to beat the preset scores on each to rescue more crew members and there’s a decent amount of replayability in going back to beat your best. 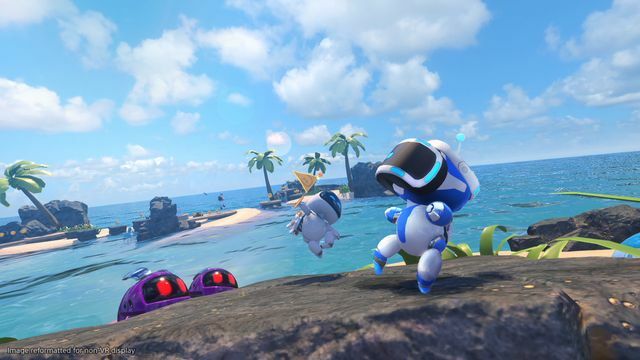 Astro Bot Rescue Mission is an essential title for all PSVR owners. It’s actually so good that if you don’t yet have a PSVR I’d recommend going out and buying one just to play the game. 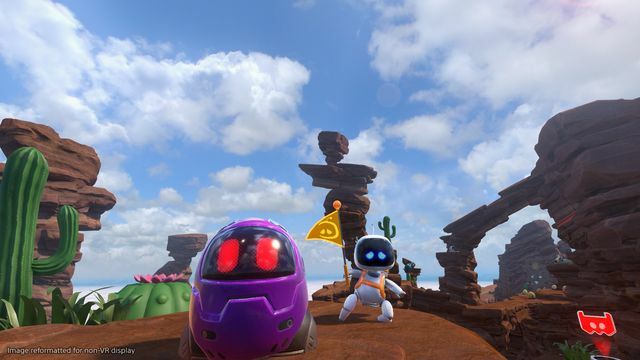 An Astro Bot sequel is now top of my most wanted games! 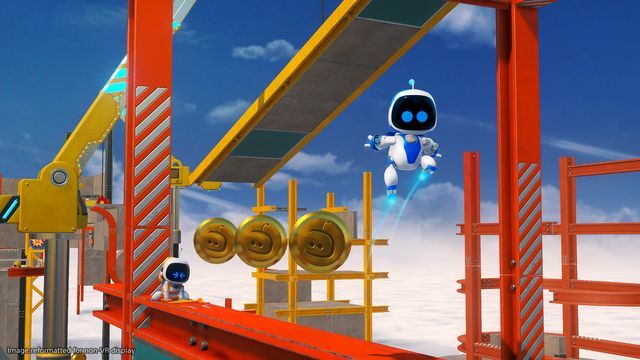 Astro Bot Rescue Mission was reviewed using a digital code supplied by the publisher.